In this episode: We begin with a trip to the slow city of Pollenzo, the Albergo dell’Agenzia, and the Slow Movement. A weekend studio tidy leads to much musing on the subject of stashing materials ahead of using them. I meant to mention how this way lies madness, but never quite got around to that. Let the record show: a reluctance to use the materials in your stash, be it yarn, fibre or fabric, may be an indication that one’s tastes in materials have changed. That’s my theory. I don’t think it’s nutty. I talk about my recent obsession with surface design, largely inspired by the work of India Flint, and I offer a review of two of her books, Eco Colour: Botanical Dyes for Beautiful Textiles and Second Skin: Choosing and Caring for Textiles and Clothing . You can read more about India Flint’s work here. 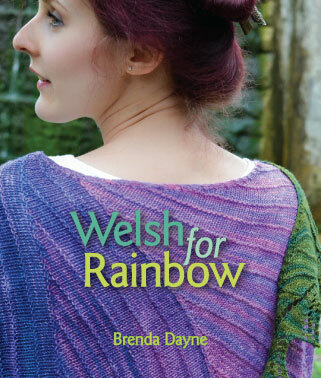 The workshop that I would give my entire yarn stash to be able to attend is here. Be sure to watch the video about her process. I wish I could go. I would love it if you did, so that you can tell me everything. Topaz Mortmain is my I Capture the Castle hero, and my inspiration at the dye pot. I’ve written about her in this Gwlana post. If you haven’t yet read the book, you must. It’s one of my favourites. Thanks to Caerthan Wrack, of Triskelion Yarn and Fibres, for teaching me to dye with indigo. His yarn is amazing. 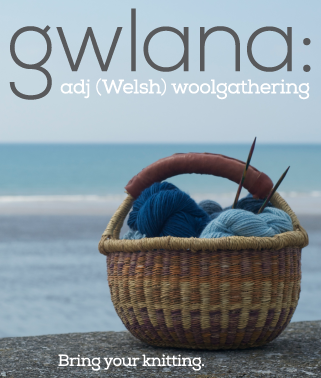 You can hear audio recorded by my friend, Felix, at the May Gwlana in this Knitsonik podcast. No chickens were eaten by foxes in the making of this podcast. Music and FX: Musetta’s Waltz, a little ditty by Pucini, from his Opera La Boheme; You Like Me, performed by Sally Field, at the 1985 Academy Awards; Cast On Blues, performed by Zach Dunlap, used with permission. SO happy to have another podcast from you! I got a big laugh from your comment about sewing detritus; does that mean you never had to deal with massive knitting detritus? My entire living room and couch is covered with my knitting detritus, and that’s despite having a craft room. I have to say I hugely enjoyed this podcast. I related so much to what you said about stashes and taste changing. I, too, have many projects started but not completed and often think about what I plan to do next before finishing what I started. I would love to learn how to dye BUT I have enough on my plate and too many hobbies as it is. Long live slow clothing! Really enjoyed this episode. 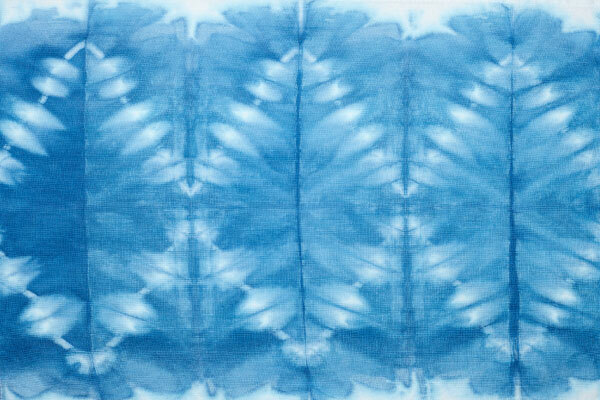 I’m starting to explore sewing in addition to knitting so I love hearing about your experiences – and now I want to dye everything I own blue!! I remember from earlier episodes of Cast On about your enjoyment of unravelling/re knitting sweaters. It reminded me of one of my favourite cast-on guest essays, during the wonderful Make Do & Mend series. It was the one from the woman whose mother grew up in a large family in China, and how every year they used to unravel and reknit the family sweaters, to spread the wearing around. I revisited it during the spring, when I listened to Cast On again (from start to finish); it resonated with me then, and resonates again today, after listening to Provisional Cast-On. It’s good to hear your voice. Yaaaaay, so happy the podcast is back! I’m a little late to discover it buuut, just in time for fall knitting. Thank you for making me smile while I knit (or frog). I’ve been a listener since some time around when you started podcasting, but I lost track of your podcast in the last 4 years or so… life got in the way. I lost my knitting mojo about 2 years ago, and only knit on occasion. In August, I decided to make a thank-you gift hat for a family member, and that got me knitting again. I found myself making mittens and then starting a new hat… and craving something special to listen to at work. Something that would help me get through a 8 hour no knitting period. I realized I wanted to listen to people to talk about knitting. People with Podcasts. Then I looked up Cast-on, and to my glee, you were still here. Still sharing. I started up around episode 90 and listened. It was wonderful. I suddenly found myself excited about my knitting again, and planning the next knit (and the next knit, and Christmas knits, and everything else). It’s rather invigorating! When i reached the current episode, i decided to re-listen to the whole series. It’s been so good to hear you again, and laugh again, and be retouched by the essays, the excitement, and the sharing. So this comment is sort of a thank you for the many years of joy, and the rekindling of a favorite hobby! I wish you success in your future endeavors, and can’t wait to listen to the next episode of Provisional Cast-on. I never commented because I had to listen to the whole archive first. Hey, would you review a book you hadn’t finished reading? Got to say I loved it from the first sound of your voice, like honey? That really good dark organic honey from local bees. Going to be a little rough now that I’m finished listening to 3 episodes a day, but back to my sad real life. Thanks for all the inspiration, and whatever you decide to put out there, I’ll be listening happily.